One of the most successful purchases I have made for my home consulting office is the Plantronics Savi Office WO100 headset, which connects to my plain-old-telephone line and also to my computer for Skype calls. The headset comes with both over-the-ear and over-the head options. The sound is great, both for me and my clients. My only complaint is that the over-the head band flops down when the headset is charging, lifting it out of the charger. A nuisance at best. I’ve found a pretty-good solution and am putting it here for the benefit of anyone who searches the Web. I wrapped a wire tie around the headset so that the loose end points toward the headband, and trimmed it short, so that it serves as a latch, keeping the headset from flopping down. 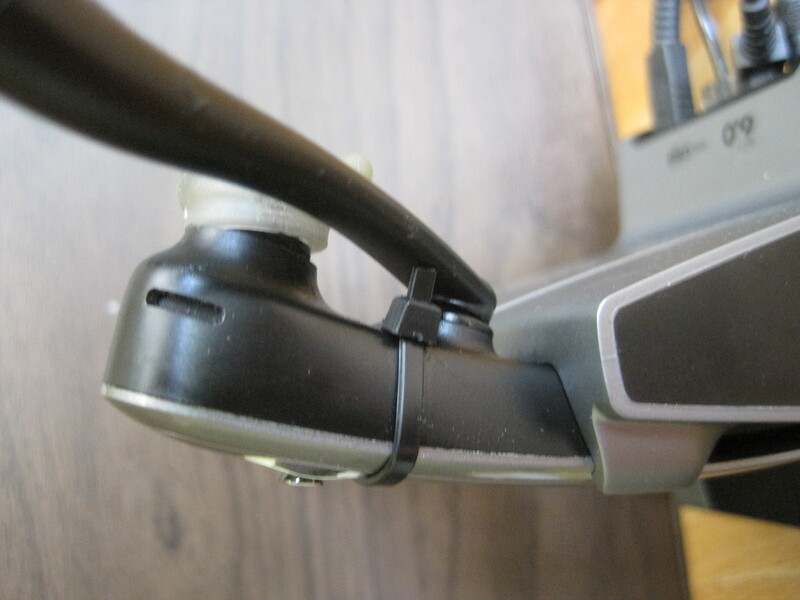 As a result, the weight of the headband pushes the headset into the charger instead of levering it out.